We’ve taken dessert to a whole new level! 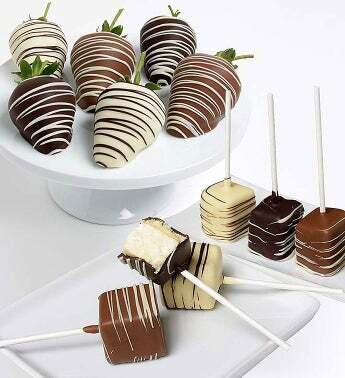 Six of our most succulent strawberries are dipped and drizzled in rich milk, white or dark Belgian chocolate. And if that’s not enough to get your mouth watering, we’ve added six decadent cheesecake bites, also covered in Belgian chocolate. This is one treat that’s meant to be savored…and shared!